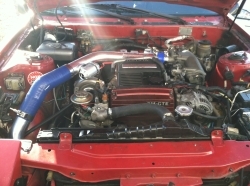 HERE IT IS THE 7M-GTEU IN MY 1984 SUPRA A SPECIAL 7M-GTEU VERSION This is a turbo a model engine. This was used only in the racing homologation toyota supra turbo, It was a road/race cars. The turbo A models also measured air based on manifold pressure rather than using an air flow meter, had a larger intercooler, larger throttle body, with a modified ct26 high flow turbocharger, and various other differences. during the short time it was produced, it was the fastest japanese car ever made. Shift Forks I started to have transmission problems about a year into owning the car. I searched the Internet for help, but was unsuccessful. At first, when I would shift 1st and 2nd gear would stick, but within a week I lost both gears completely. As you can see in the pictures, I had a broken shift fork.